What is there to know about Dominique Witten? Well, if you’re interested in high-powered comedy, everything. From headlining comedy clubs, to showing-out on television, Dominique is the new face of funny in America. She’s created laughs on stages across the world, including NBC’s Last Comic Standing, HBO’s Def Comedy Jam, Comedy Central’s “Chappelle’s Show,” O.W.N.’s “Herlarious” and the hit television series “Black Jesus,” now airing on Adult Swim. As a Washington D.C. native, Dominique honed her skills unprofessionally as a postal worker at the infamous Brentwood Postal facility. As a mail sorter and resident comic, Dominique kept the night-shift alert, and amused while perfecting jokes. At the urging of coworkers and relatives, Dominique sought stand-up work at local comedy clubs, which came easily after a few performances. Dominique attracted diverse audiences with a mixture of political and cultural comedy that made audiences think, and laugh. She quickly gained notoriety for telling it like it is, raw and uncut. In a pre-internet world, Dominique’s fan-base grew quickly and word of her talent drew attention from HBO’s “Def Comedy Jam.” After a strong performance on Def Jam, Dominique pursued her comedic dreams full-time, moving to New York City to perform amongst the best of the best. Before long, Dominique became a fixture of New York’s comedy scene, performing alongside comics like Chris Rock and Dave Chappelle. During a chance encounter at a small comedy club, Dominique impressed “30 Rock” and “SNL” star Tracy Morgan, who immediately made Dominique the opening act for his “Caroline’s on Broadway” show. Since then, Dominique has wowed audiences from London to LA, and all points between. 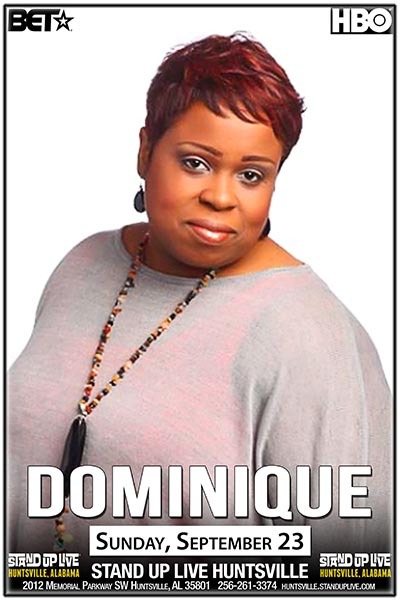 In addition to stand-up and television, Dominique has drawn laughs from radio audiences across America during a regular segment on the “Tom Joyner Morning Show.” From this platform Dominique became known as the ‘people’s champ,’ a comedian who speaks for the common man and woman of America. Run, don’t walk to Dominique’s next show, she’s the new face of funny!